As part of its ongoing review of service provision, the Department of Infrastructure Housing Division and Public Sector Housing providers in the South of the island have formed a Southern Area Housing Working Group to work closely together in order to investigate, modernise and improve service delivery of Housing. One of the initiatives being explored by the Group is that of a Shared Waiting List and Shared Allocations, meaning that in the future applicants may have considerably more choice over the number, location and type of property available to them. Terms of Reference have been signed by Arbory Parish Commissioners, Castletown Commissioners, Malew Parish Commissioners, Port Erin Commissioners, Rushen Parish Commissioners, Santon Parish Commissioners and the Department of Infrastructure is at present exploring how to make this a reality. During the initial stage of this review, each of the aforementioned Housing providers in the South will be writing to applicants held on their respective Waiting Lists during the week of 15th February to explain how this will be conducted. Another aspect the Group is actively exploring is opportunities within the procurement of repairs and maintenance of the housing stock of more than 1,350 dwellings within the South. Malew Parish Commissioners are pleased to announce that the rates levied for the forthcoming financial year 2016/17 will remain at 175p. It has been 10 months since the Commissioners took over the transferred services from the Department of Infrastructure. The Commissioners now have control over the road sweeping, weed spraying and hedge cutting (except for the A3 & A5) which the Board believes have been a very positive step and has resulted in programme of sweeping and spraying that hasn’t been seen for some time. A major capital project in the addition of street lighting in the Balthane Estate has been completed. This has proved to have been welcomed by the businesses and visitors of the Estate. The administration at Malew Commissioners has continued to demonstrate efficiency improvements, whilst also delivering new initiatives. Looking forward to the next financial year we will continue with improvements to the transferred services and target those areas of need. There are changes to the structure of how Local Authorities are charged for waste and this has shown a slight increase in cost to Malew. However, it is positive that domestic waste will no longer be subject to the Waste Escalator charge which included the capital costs for providing the EfW plant which would have seen domestic waste taken to the plant being charged at around £170 per Tonne by 2018/19. Commercial waste disposal is to rise to £165 per Tonne. The contribution made by Malew to the Southern Civic Amenity Site remains unchanged. 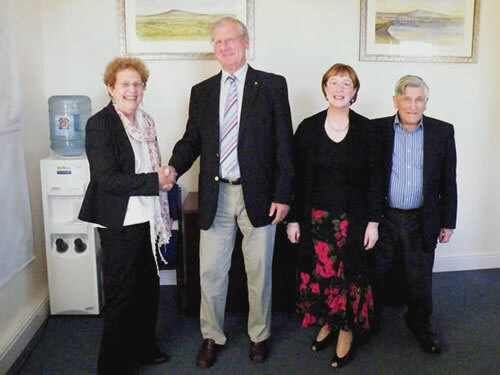 Malew Commissioners encourage local residents to take a keen interest in our business. The updated website has attracted a large number of views since its launch in October 2015. The Commissioners would like to remind all residents of the Local Authority General Elections that are taking place on 28th April 2016. Please ensure you are registered to vote. You can do this by calling into the Commissioners Offices. Malew Commissioners consider all planning applications submitted to the Department of Environment, Food & Agriculture, Planning Section that are relevant to the Parish of Malew. The Commissioners do not have the powers to approve or refuse planning applications. They are, however, classed as an ‘Interested party’ and as such have extended powers to participate in the planning process. Malew Commissioners will consider the proposals in a planning application primarily against the Island Strategic Plan and the Local Plan. Both these documents specify planning policies to control development, such as land use and zoning. Consideration is also given to representations made by consultees, (which may include other Government Departments, statutory bodies, interest groups and other local authorities) along with any private representations from members of the public. The Board will measure all these matters against the merits of the proposal. Their findings and recommendations are then presented in a formal submission to the Planning Authority. As an ‘Interested party’ to planning applications the Commissioners are afforded the right to appeal planning decisions which are special to the Isle of Man planning process. Appeals may be submitted against a decision of the Planning Committee within the timescale allowed for which the Commissioners have to remit a fee of £150 to validate any appeal. Once a decision on a planning application has been made it will not become final until the period in which appeal may be lodged (21 days) has expired. The Commissioners have the same consultation period as the general public and must therefore make their submission within 21 days. – Malew Commissioners will receive a copy of all planning applications relevant to the Parish of Malew. – All planning applications are advertised by the Department of Environment, Food & Agriculture on its website and a notice should be displayed on the site. – All comments/objections MUST be sent to the Department of Environment, Food & Agriculture within 21 days for them to be registered, however the Department will accept comments at any point prior to a decision being made. Please click the following link for the latest information on road closures for the rally. The past year has been most challenging and The Commissioners continue to look for ways to improve operating efficiencies. You may recall that in the early part of the year the day that refuse collected was changed, this along with changes to the kerbside recycling scheme has enabled us to ensure the most efficient use of the vehicles and labour time. This has resulted in a reduction in our fuel costs and cut down on the number of trips to the Energy from Waste Plant (EfW). Also the bring banks that are in place at Abbotswood, Clagh Vane, the Railway Station, Derbyhaven and St Marks continue to be well used. Nearly 50 tonnes of waste has been collected at these sites over the past year, reducing the amount sent to the EfW saving some £4,000 in charges. The Isle of Man Government continues to review its functions and the services it provides. It has identified functions that it believes would be better provided at a local level by Local Authorities. These functions are road sweeping, gully cleaning, hedge cutting and weed spraying. The Commissioners have agreed to take over these responsibilities but obviously there will be costs associated with it. Although the gate fee for EfW has been frozen for a year, the net result has no benefit for the Authority. Regrettably, we have no alternative but to increase the rates to cover these costs as, unlike some other Local Authorities, we do not hold large reserves. The increase is just over 5% and equates to approximately £15 per annum for the average ratepayer. However, we hope that there will be a noticeable improvement in the level of these services as a result. As you can see, the majority of your rates bill is due to Water & Sewerage Charges. Over the coming year we hope to progress on a lighting scheme for Balthane, improvements at the Commissioners playing field ‘Keigh Keign’ and more recycling. We do appreciate your continued support for our initiatives and sincerely hope that together we can make Malew a better and more desirable place to live. Former Commissioner Mr David Allsebrook and current Vice-Chairman Mr Bob Pilling , very kindly donated two paintings, especially commissioned, to the Parish of Malew. The paintings, by local artist, Barbara Lace, are of views of Malew, one from the bay at Derbyhaven and the other from Blackhill towards South Barrule. The Chairman, Mrs Barbara Brereton on behalf of the authority, thanked both Mr Allsebrook and Mr Pilling for their kind generosity. The paintings have been hung in the Board Room of the Commissioners offices in Ballasalla.